Her Outdoors and myself have become racists. Well at least anti Gypsy. Well, more specifically anti the family who camped in the field next to our house! We didn’t want to become anti Gypsy and have spent a lot of our adult life challenging other people’s attitudes to different cultures. For me, my abhorrence of racism stems from being brought up in a family with an Irish Catholic background in 1950’s England and the prejudices that prevailed at that time. For ‘Her Outdoors’ it’s because she is such a lovely, accepting woman who abhors prejudice of any kind, to anyone. Her Outdoors and myself like travelling and have occasionally enjoyed the ‘Gypsy’ lifestyle. (Our longest trip in the motorhome was for six months) We enjoyed meeting fellow ‘silver surfers’ although many of them were appalled at me describing them as ‘Travellers’. 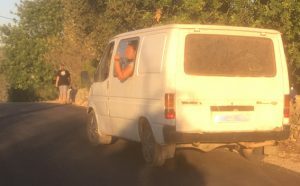 “So, you are living in your motorhome, wandering around Europe and are not working, but you wouldn’t describe yourselves as… “. Sundance and ‘Her Outdoors’ in Albi, France. 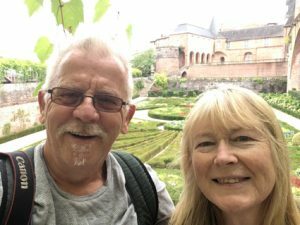 So, we were making our way back to our home in Portugal having been back to the UK to visit our families, then on to France visiting French friends, before meandering our way back through the Pyrenees and Spain. We intended to take 3/4 days for the last leg through Spain, but got a call from a friend telling us someone had broken into our garage. “Oh dear” we thought, “at least there isn’t much in the garage”. Except our two motorbikes, four bicycles some building materials and all my DIY tools. But we were not too dismayed; at least they didn’t get into the house. Shortly after, we got another call from our friend, saying they had also broken into the house! The burglars had apparently pulled the doors closed when they left, so it looked secure. Our “Oh dear” was replaced with “Oh b******s””. At which point we decided the leisurely drive through Spain should be curtailed by pressing a firmer foot on the accelerator. We started cataloguing missing items, as the GNR (local police) were expected and we thought they would be interested in what had been stolen. TV, DVD player and remote controls, two old laptops, a computer monitor, video tripod and sound recorder, video lights, a washer (for laundry, that is, not as in nuts, bolts and…) The list got longer and longer. But we noted items that had been left; microwave, kettle, and toaster. At this point ‘Her Outdoors’ got irate. “What’s wrong with our British goods?” she wailed. Actually it was more of a contemptuous statement (I’m trying to elicit sympathy again). Image ‘illegally’ taken, as advised by GNR, so doctored to protect the ‘innocent’. Allegedly. The immediate problem we had was the doors and how to secure them overnight. 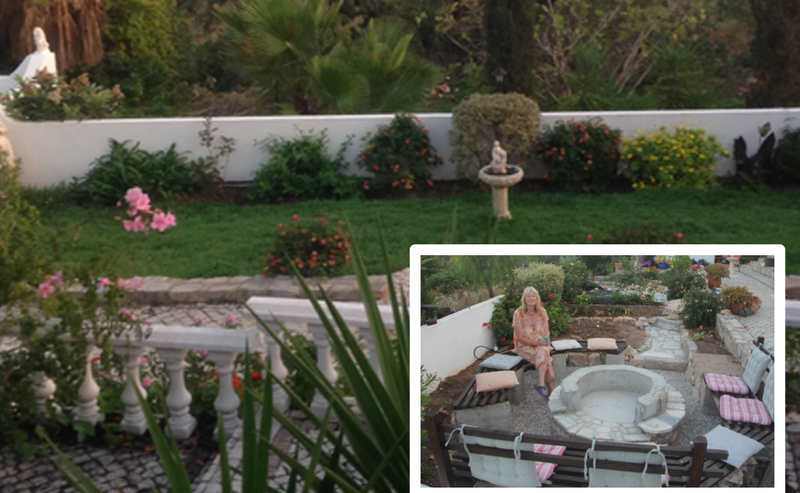 Because of the layout to our Quinta, we have three doors on our terrace that give access to various rooms. They broke through all three (as well as the garage). One room is my office, which we decided to leave unlocked overnight, partly hoping that the burglars would come back to tidy up. The office is next to our utility/larder from which they took our beers, wines and other less precious items such as bottled water and large bottles of our homegrown olives, which were curing. Fortunately they didn’t take our stash of marmite! The door to the main house was barricaded inside with heavy furniture. We were concerned they might come back for the kettle and toaster. The next day I had to go to the GNR to make a formal report. What a horrible experience that was. It started with me apologising that I don’t speak Portuguese and asking if they spoke English. “NO, ONLY PORTUGUESE!” came the response from a rather arrogant young GNR. 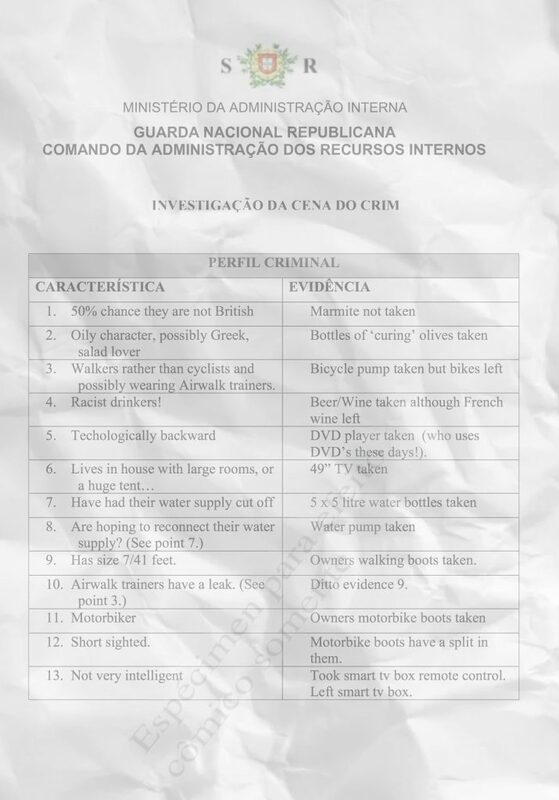 Eventually, a translator was summoned and a report was written with a list of stolen items and values. The arrogant one’s single finger typing took some time. I started to feel like I was the criminal, confessing my crimes. Report writing was punctuated by quizzical looks and wry smiles between the arrogant one and the friendlier translator. The olives obviously resonated with them. The report writing was also punctuated by other officers coming through the office to say hello to the arrogant one and tell him about their previous night out. Or so I thought. Eu náo falo Portuguese, remember. Life has got back to normal now. Her Outdoors is spending even more time outdoors. She’s not quite gardening with her head torch on yet, but she is finding it difficult to find her way back to the house in the dark, ever since the solar powered fairy lights disappeared. Bugger! Another one for the list! I wonder if I could type that one myself? We’ve been in Portugal for two years now and for most of that time I’ve made learning the lingo a big priority. But it’s not easy. Our first teacher was a delightful Irish church worker, who was also a trained teacher and offers classes to raise money for his church. He was good. However, many of the twenty plus learners were not. 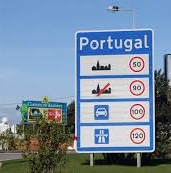 Despite most of them having been in Portugal for over five years we got no further than the present tense of the verb ‘to be’. He had the patience of a saint but we didn’t, so after five or six weeks of squashing into a classroom smaller than our kitchen, we decided to move to fresh fields. Our second teacher was a Portuguese woman raising money for the local community centre. We were hopeful when we found the class was less than eight and in a decent-sized room where we could clearly see the whiteboard. However one of the group sent our teacher into despair, with his incessant need to know ‘why’ teacups are feminine and flowers are not. We stuck at it for several months feeling a great solidarity with other students suffering from her put downs, fingers drumming the table with impatience and high pitched rants (particularly directed to the male students) . I don’t recall ever being so panicked, close to tears, migrainey and nauseaous as during her classes. We lived through dramas of dictionaries being purposefully flung in her direction, people stomping out and respected senior citizens being reduced to tears. Don’t let any of that put you off – it was enjoyable on all counts. Except those. Oh, and comments like “Alan you’re as bad as Graham” was not the way to encourage students, so we gave her the heave-ho and looked for someone with more patience (or Valium). Unfortunately at this stage Alan more-or-less dropped out, although from time to time I do find him secretly using Duolingual to brush up his Portuguese vocabulary. I found a delightful Portuguese young lady wanting to teach Portuguese. Yolanda is bilingual, having grown up in South Africa and is full of energy and interest in our language acquisition. I can’t praise her highly enough and decided to ask Christine, a French friend, to share classes with me. Christine’s Portuguese is far better than mine on account of her native French being a lot closer to Portuguese than English, added to which she already speaks Spanish and is, in fact, a linguist. I hoped that her language abilities might somehow sweep me along with her to attain higher levels. Well I was ready for the challenge anyway. A lack of victims to practise on is my main problem. We live in a location where there are many other expats and have little cause to speak to random strangers in public. Even brave attempts at striking up some small talk are usually shattered when the reply is in English or, on the rare occasion when it’s not, the chance of knowing what is said back is slim. In a bid to get more exposure to listening, I’ve been watching Portuguese TV on Youtube, namely children’s animated stories. I was mightily chuffed when our 3-year-old grandson showed interest in this pastime and Garibalde o balde became our shared friend. Chef’s Academy is another program I watch. I can’t work out why it’s called this and not something in Portuguese, but there we go. It’s a vaguely familiar format, where a celebrity chef demonstrates three dishes simultaneously whilst the contestants watch on scribbling furiously in their notebooks before having a go themselves and then getting horrendously slated by the judges. What makes it useful as a learning tool is that it is very visual and relatively limited in communication with not much of a plot to follow. What makes it useless is that all I am learning is a wide vocabulary of cooking terminology. Well, it’s a start. In another attempt to force myself to speak Portuguese I joined Speaky.Com in order to find online language partners. This is easier said than done as 99.9% of those wanting a Portuguese/English exchange are Brazillians apparently on the look-out for a new love interest. However, I have made two friends through it; Pedro who needed IELTS to start a PHD he’d got funding for in London and my dear friend Maria from the Alentejo region. She’s enriched my life enormously, teaching me many things about P and they way people see things here. 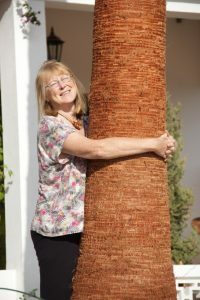 She and her husband have stayed with us and we’ve had wonderful visits to Sines, met her children, grandchildren, shared her birthday and has become my Portuguese sister.